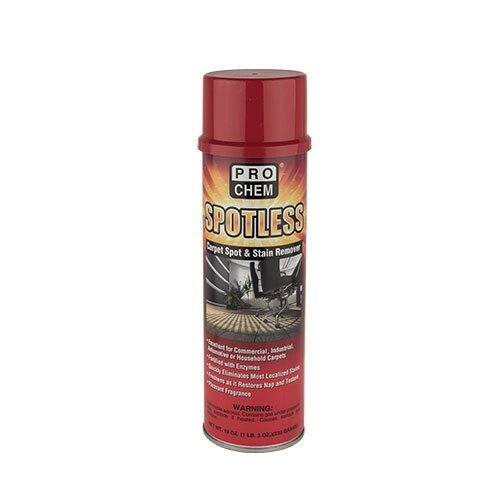 Spotless | Pro Chem, Inc. This specially formulated carpet spot remover cleans and degreases localized stains and spots on carpet. It effectively eliminates localized stains due to oil, tar, grease, ink, lipstick, marking pens, mud and dirt, mustard and ketchup, urine, other pet stains, coffee, tea, vomit, soft drinks, alcohol, blood and numerous others. The inverted valve allows for easy treatment of floor surface without kneeling or for easy access to confined spaces. Concentrated stream allows product to be sprayed directly where needed for easy treatment. Shake can well before using and invert can to spray. Always test product in an inconspicuous area before general use. For wool and light colored carpet, test for possible stain bleeding and color-fastness on a small portion of stain before proceeding. Previously treated stains created by spotters, acids, dyes or other chemicals may become permanent and may not be removed by this product. For Fresh Spots: Blot up excess liquid. Spray evenly over spot without saturating. Allow time for product to penetrate. Blot with clean damp cloth or sponge. Repeat process, if necessary. Allow area to dry, then vacuum and brush to restore pile. For complete overall maintenance, extract carpet with steam or water extraction. For Old and Stubborn Spots: Spray spot thoroughly. Allow at least 60 seconds for product to penetrate. Agitate surface lightly with a soft bristled brush then blot firmly with clean damp cloth or sponge. Heavily soiled areas of grease, oil or ink may require several applications. Use gloves when using on bodily fluids such as urine, vomit, and blood.